Summer in Chicago is the perfect time to get out and explore the city. The weather’s beautiful, the city’s high in energy, and there are tons of exciting festivals and tours abound. So, whether you’re visiting for business or pleasure, or you’re a true Chicagoan yourself, it’s time to get outdoors and take in all that Chicago has to offer. Here are 5 summer tours that are constantly running throughout the summertime. If you’re looking to learn more about Chicago’s history, there’s no better way to dive right in than with an architecture tour by The Chicago Architecture Foundation (CAF). There are several to choose from, all boasting different forms of transportation. Here, you can explore downtown Chicago’s iconic skyscrapers and hotels, take a peek into Chicago’s diverse neighborhoods, or take a tour of the renowned homes of Frank Lloyd Wright. And, if you’re really up for it, try them all! When the Chicago River is right in the heart of Downtown Chicago—and features the Riverwalk, a path with casual eateries, perfect for a sunny, Saturday afternoon—there’s no reason to not get out on the water and see some breathtaking views of the city. What’s more, you’re bound to experience beautiful, warm weather in the summertime. 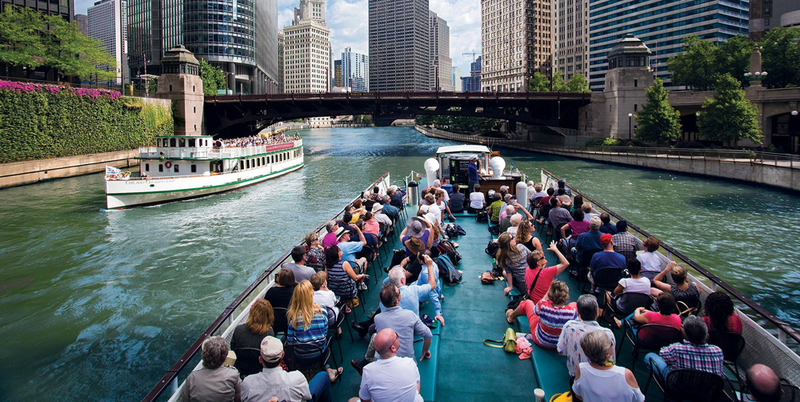 Choose from a variety of Chicago boat tours and pick one that stands out. There’s no denying it—Chicago has an extraordinary food culture. The good news? You can explore a few different cuisines and neighborhoods all in one Chicago food tour, for when you’re short on time. There’s a variety to choose from: Pizza tours (deep dish, anyone? ), a Chinatown tour, donut tours, steakhouse tours, and more. What’s more, you can wash all that down with Prohibition tour to follow. If you’re not into walking (though Bobby’s Bike Hike Chicago does offer walking tours, too), explore Chicago on a sunny, summer day by bike. With several to choose from, you can pick based on mood, company, and time of day. For instance, if you’re biking with the kids, you might want to try the Bobby’s Tike Hike: Kid’s Edition Bike Tour or the Museums & Parks at Sunset Bike Tour. And, if you’re leaving kids at home, try a nighttime ride, City Lights at Night Bike Tour. Especially great for people new to the city, the Segway tour in Chicago gives you an inside look into all the legendary spots, from movies, postcards, and Chicago history. First, you’ll get some fresh air by Segway, and then you’ll head upwards to see unparalleled views. At the Skydeck, the observation deck at Willis Tower, you’ll get the chance to see amazing, 360-degree views on the 103rd floor.